Last week we had our first snow, which at the Hicks' home, means we make Snickerdoodles! I have had a few requests for this recipe this week...so here it is. I've tried several recipes and by far this one is the best!!! Cream butter, shortening, sugar, vanilla and eggs until light and fluffy (you can't overbeat this!) Add dry ingredients. Make into small balls and roll in a cinnamon and sugar mixture (1 cup Sugar and 2 Tsp. Cinnamon). Bake at 400 degrees for 8 minutes...and be prepared for the ulitmate yummiest cookie! PS -- You may want to have hot chocolate ready and waiting! This scripture verse in Psalms 91:4 "He shall cover you with His feathers and under His wing shalt thou trust." is such a sweet comfort. I love birds...always have, obviously my business name is all about Tweets. This passage is a great reminder that we are all covered under His wing and deeply loved by our Father....it's a sweet and simple reminder that we are never alone! If you are like my I have a zillion DMC flosses that are left -over from my various half finished and some finished projects. My "floss drawer" was such a tangled mess that I would usually give up and buy new DMC anytime I needed a color....until now! I bought three clear jars and three super cute vinyl decals from The House Of Smiths, a ton of little wooden spring clothes pins ....and three bored sons. All it took was unraveling the somewhat good floss or the flosses that still had their tags onto clothes pins. 1. Place the loose end inside the spring opening. 2. Wrap the rest of the floss around the outside of the clothes pin until you get to the end. 3. Tuck the end into the top of the spring loaded pin. 4. Using a pencil, write the DMC floss number on the wooden clothes pin for reference. 5. Fill those cute jars!!! 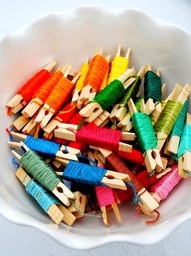 Now I love finding a floss color and they look very cute sitting there waiting their turn to be used. This was one of many ways to organize a floss drawer....but for sure was my fav!